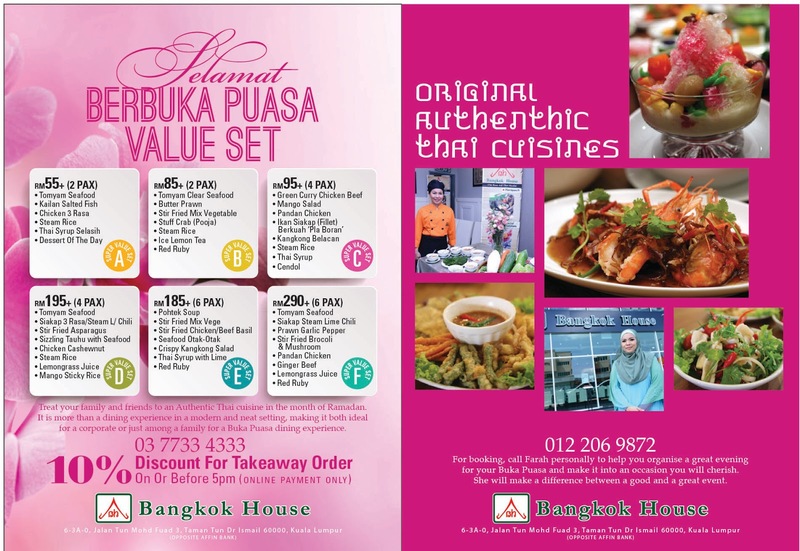 This months-old Thai restaurant in Taman Tun Dr Ismail KL is a whiff of lemongrass in a neighbourhood of cafes, mamak shops, kopitiam and fast food joints. Sisters Farah and Sarah Hassan who originate from Thailand, are well known for their Thai cuisine. The menu comprises a mix of southern Thai dishes and Bangkok flavours. As I step inside, I am impressed by the clean tidy rows of tables and white chairs in front of a chiller where there are cakes and bowls of green, pink and yellow ingredients. These are fruit and other items for the dessert dishes. There’s an upstairs section, usually reserved for private and corporate parties. For Ramadan, Farah tells me there will be six set menus of dishes to go with rice, drinks and dessert. While these are designed for between two and six diners, bigger groups can add on dishes from the a la carte menu. I am trying the menu for six (RM185+). There’s pohtek soup, stirfried mixed vegetables, stir fried basil chicken, seafood hor mok (otak otak), crispy kangkung salad, with drinks and dessert. Diners start with a chilled drink of red Thai syrup with a squeeze of lime to give it a refreshing flavour. Pohtek soup is clear seafood tom yum, not the usual fiery red version. Kept hot in a pot with fire in the funnel, it’s mildly hot and there’s plenty of crab, prawn, squid and mushroom. The crispy kangkung is addictive, especially when it is served with the house dip made with minced chicken and sliced shallots. So yumeh! Basil minced chicken and hor mok go well with steamed rice. Hor mok is otak-otak and has fish, prawn and chunks of crab with shell in it. Dessert is a bowl of tub tim krob (red chestnut) with sliced jackfruit and coconut milk. Dishes for the various set menus vary and you can also ask for additional a la carte dishes. A choice favourite is fish steamed with a light and tangy lime gravy with lemongrass. Just before serving, chopped chill, coriander and sliced garlic are added for extra flavour. Or have some red fresh water prawn tom yam (from RM20). This hot, sour soup will perk up your appetite instantly. Stuffed crab is perfect for families with young children. The combination of minced chicken with crab, onion and carrots is stuffed into crab shells and deepfried. Eaten with a chilli dip if preferred. 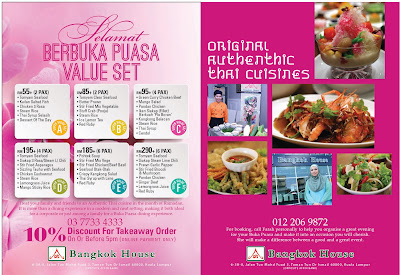 Ramadan set menu: 2 persons (RM55+ and RM85+), 4 persons (RM95+ and RM195+), 6 persons (RM185+ and RM290+). A la carte also available.